Ten points for originality: the route through Suzuki Plaza does not start with the first product, unlike in most other museums. Instead the visitor is treated to... a business meeting! The 3,489 square metre large building is situated right next to one of the Suzuki factories. Regrettably a visit to the factory is out of the question, so instead Suzuki shows how to create a car from the first idea to the final assembly. In the staged business meeting, designers exchange ideas. They want to develop a spacious, comfortable, frugal yet affordable car. So far, no revelations. Still, the out-of-sync video with Japanese men speaking perfect English is good for a chuckle. The next room shows how an idea evolves from the first sketch via a clay model into a prototype. The visitor soon finds out the car being developed is the current Suzuki Splash. At Suzuki Plaza four original concepts can be seen, one of which was eventually chosen for the production model. During such a process, computer simulations show the car in various colours and surroundings. The visitor can also place a virtual Splash in a colour and a scenery of their choice. Thanks to this and many other interactive parts Suzuki Plaza is also fun for children. Once the design is ready, tried and tested, the new car will be taken into production. In a beautifully made 3D film the visitor takes a virtual tour through the factory. This is done so well that it is actually better than a real factory tour! A goofy cartoon character makes the movie fun, so despite its long running time it never gets boring. In a reproduction of a factory the most interesting parts of the factory are shown once more. The big difference with a real plant: at Suzuki Plaza everything is interactive! By far the most exciting is the "Robotlab", where visitors can operate a giant robot arm and move car parts around the factory floor. And don't forget the plastic-press: it produces scale models of the new Swift to take home as a souvenir. The production process as shown hardly differs from other brands. A spokesperson of Suzuki Plaza has a different opinion and states that Suzuki has more experience with building compact cars than any other make. This supposedly makes a small but significant difference in the craftmanship shown in every product. Once the visitor knows how a Suzuki is developed and built, it is time to discover the history of the brand. It starts with looms. Every day Mister Suzuki rode his bicycle to work. Pushing the pedals hard to overcome the headwind, he thought it would be great to have a motor-assisted bicycle. 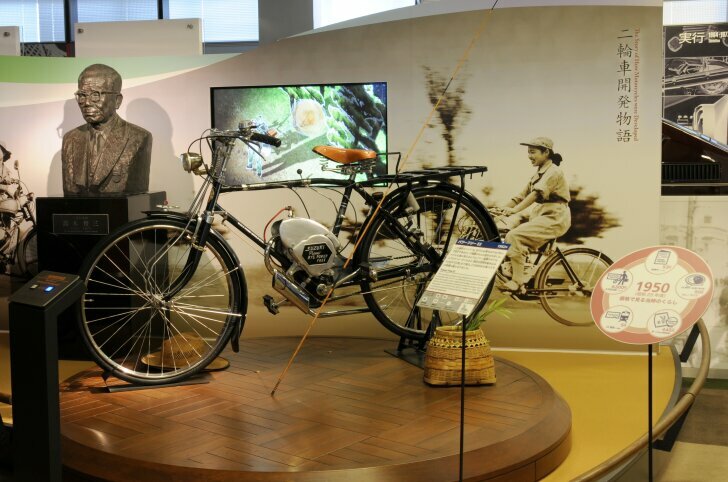 In 1952 he started producing his motor bicycle, and not long after Suzuki expanded the range to real motorbikes. 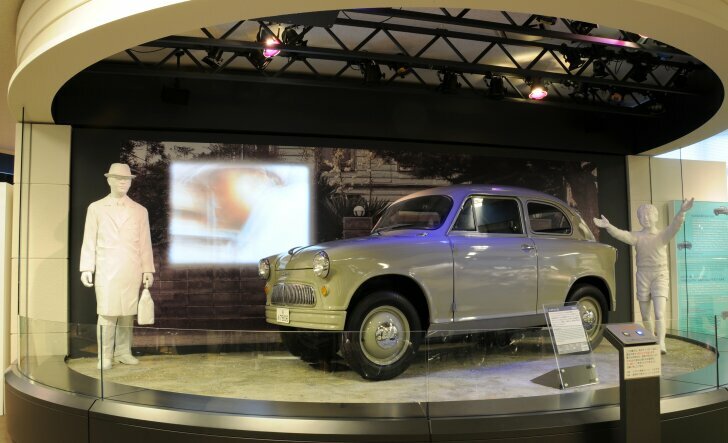 In 1955 Suzuki introduced its first car, then named "Suzulight SS". Despite many setbacks while developing, the press eventually named Suzuki's first car the best in its class. At an early stage Suzuki, saw a demand for small commercial vehicles and in 1970 the first Jimny was released; a model that is available to this very day. The definitive breaktrough for Suzuki came in 1979 with the introduction of the first Alto. Thanks to its low price (470,000 yen) Suzuki made cars affordable for the average man. For example: in those days an Alto cost the same as two VCRs! 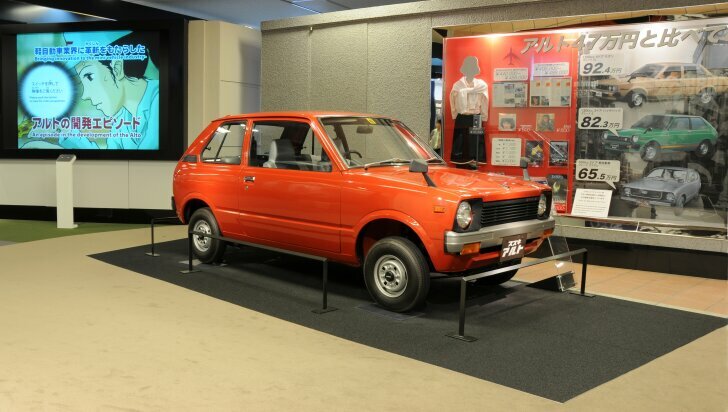 To this day the Alto is Suzuki's most popular model and all generations are on display in Hamamatsu. In the mid '80s the first Swift, known as "Cultus", was introduced in Japan. The '90s are characterised by fun cars like the X90, Vitara and a series of highly successful racing bikes. Just as interesting are the models which have been developed solely for the local market. For example, the "Twin" is a two-seater hybrid car that can still be seen on the Japanese roads. Autozine's favourite is of course the Suzuki Cappuccino: a vehicle which Autozine owns. That is why the visit to Suzuki Plaza also felt like a visit to the birthplace of Autozine's pet car. Located in perhaps the most dreary town of Japan is the most fun car museum of the country. The headquarters of Suzuki are located in Hamamatsu. That's because of historical reasons and because of low ground prices. In turn this can be translated into low car prices, one of the foundries of Suzuki's success to date. 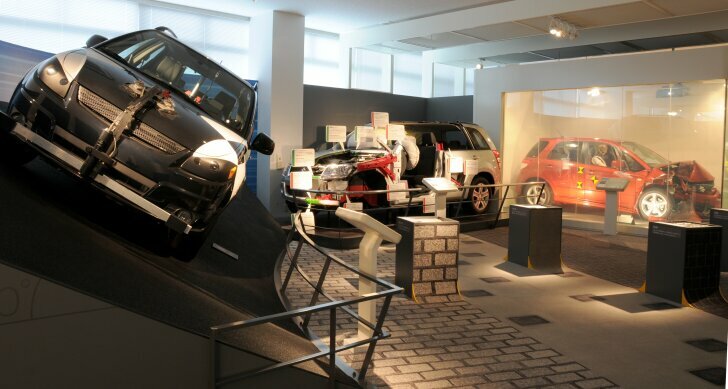 Regrettably the plant itself cannot be visited, but a permanent display named "Suzuki Plaza" gives an even clearer picture of what happens inside the factory. Compare it to viewing a large event on TV, which may be easier to comprehend than in real life. 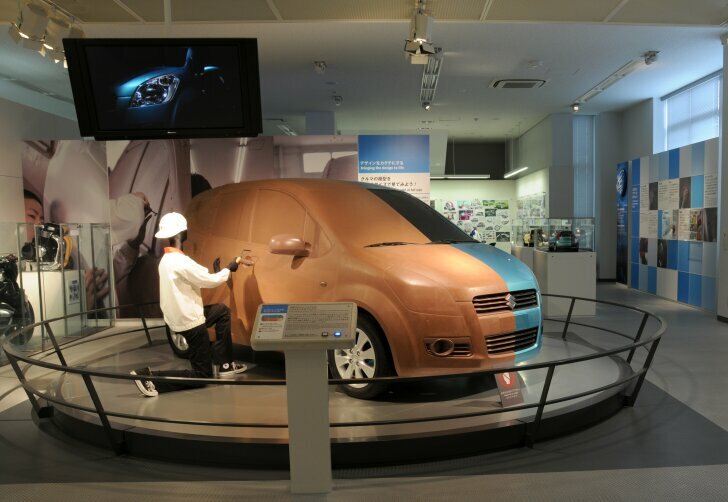 Besides a peek behind the scenes, Suzuki Plaza shows the history of Suzuki from the first loom to the latest cars. All information is available in Japanese and English. While the museum is quite small, the many interactive parts make it more interesting than many large museums. Just like Suzuki: small but beautiful.